After what looked like “an issued-based” kick-off to the 2016 general election campaigns on Tuesday, President Museveni yesterday shook off his gloves and ridiculed former prime minister Amama Mbabazi and Dr Kizza Besigye, as a pack of incompetent leaders. Explaining the NRM’s “continuous journey” he started with the liberation war of 1981 to 1986, Museveni sought to undo Mr Mbabazi’s campaign slogan saying it’s him (Museveni) “going forward” and not Mr Mbabazi. While in the past Mr Museveni said he sacked Mr Mbabazi for “creating cliques”, yesterday he said he fired Mr Mbabazi for telling lies of how he, the President, was preparing to instal his son Brig Muhoozi Kainerugaba as the next president. “I sacked Mbabazi because he went around the country saying I was preparing my son, Brig Muhoozi, to become president. My son has never even stood for LC1 and the Constitution is very clear on how one can be elected president,” Mr Museveni said. Brig Muhoozi is currently the head of the Special Forces Command, which guard the President. Former coordinator of Intelligence Agencies, Gen David Sejusa, formerly Tinyefuza, stoked the fires in 2013 when he wrote a letter to the Director General of Internal Security Organisation (ISO) calling for an investigation into allegations that certain individuals opposed to an alleged “Project Muhoozi” had been targeted for assassination. He fled the country to exile but has since returned. However, the Go Forward group spokesperson, Ms Josephine Mayanja–Nkangi, said Mr Mbabazi has never made reference to Muhoozi being groomed to be the next president. Mr Museveni also called Prof Venansius Baryamureeba, another preseidential candidate “a young boy” who failed to run Makerere University as vice chancellor and wondered how he intends to manage a country of 38 million Ugandans. Mr Baryamureeba yesterday accused Mr Museveni of panicking and insisted he is capable of leading the country. Mr Museveni, who had called a press conference to recap his inaugural campaign speech at Kololo Idependence Grounds because a downpour interrupted him, claimed the 2016 election will not be a tight race because his main challengers Mbabazi and Dr Besigye don’t have any message to tell to the voters. “There will be no tight race in the election. What are Mbabazi and Besigye going to tell the people? Unless Ugandans are mad, why should they vote for Dr Besigye and Mr Mbabazi who are telling lies?” Mr Museveni asked. Mr Museveni said Dr Besigye deserted NRM in 2001 but he stayed and solved the problems he left behind. He also said he sacked Mbabazi as premier and NRM secretary general because he abandoned work and that he was spreading intrigue in the party. 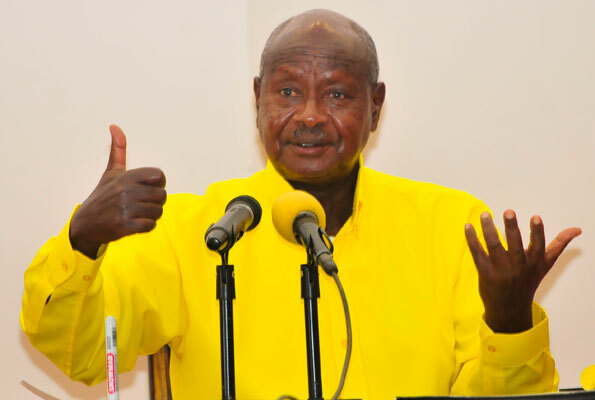 Clad in a long-sleeved yellow shirt, the official colour of the NRM party, Mr Museveni appeared confident and said unless he is either dead or sick, there is no way Besigye or Mbabazi can lie to the public. He said if he goes to the villages during campaigns he would explain to the voters in the local languages, so that they understand the Dr Besigye and Mr Mbabazi’s incompetences. On the issue of vote-rigging. Mr Museveni said for the last 53 years he has been fighting rigging and what is now remaining is the use of finger print technology during elections. He defended his sole candidature as “democracy at its best” and refused to condemn the NRM losers who want to run as independents in the forthcoming elections, saying he can only get tough on them if an internal investigation reveals the primaries were free and fair. Dr Besigye was not available to respond to Mr Museveni’s claim that he was a deserter as he was busy with his inaugural campaign rally at Nakivubo stadium yesterday. Source — NTV video and Daily Monitor report.